Unfortunately, the Clearinghouse didn't have the back end apparatus to host any of the popular blog platforms. And there were concerns about security in a PHP/MySQL setup. At first it looked like a unified solution would not be possible. But Mike is a great guy who is willing to push the boundaries a bit. He told me they were experimenting with virtual servers for local projects at Colorado State. After a few months of testing, in mid-September Mike got a virtual Windows Server up and running, with IIS on it. WordPress on Windows? Hmm. 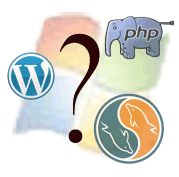 Generally, Windows and PHP with MySQL don't even belong in the same sentence. My first response was, "This won't work." Then I thought, "This won't work without major hacks, patches, and a major months-long headache." Surprise! WordPress is notable for its famous "5-minute installation" instructions. Right in the instructions are guidelines for installing WP on Win. Microsoft has a FREE (yes, free) product called MS Web Platform Installer that makes relatively quick work of all this headache. Get it installed on your server and you can manage all the app downloads and installations through checkboxes and a GUI. Sweet! It wasn't quite that simple, though I have to take some of the blame because of my lack of knowledge. I didn't know there was something called IIS until I started trying to run a tool built to run on Apache on a Windows Server. It took a couple meetings with some web folks at UNE (Al and Neal, thanks!) before I started to get a handle on the Windows Server/IIS thing. My internet access in Maine is pretty spotty, and this really limits file transfer speeds. The first installation of WP went into a subdirectory, and so it was in the wrong place. And the FTP access wasn't activated on the server until after I poked around.What is amazing to me is that it's running at all. And it is! The new power of WordPress 3 is that it can run multiple blogs in a single installation. It's important to activate this feature within 30 days of an installation. I don't know if NEWACC will have a use for this feature, but if we don't do it now we'll find it harder to handle down the road. So I took on this piece as well. I found instructions for Network activation on a Windows installation of WordPress at Laura Gentry's site. Smooth as silk. 4.5 months into the project we're set up with server space at Colorado State. We have a virtual server running WordPress 3, a platform that will integrate the NEWACC website with the NEWACC blog, and a tool that can actually scale up to host multiple blog or sites over time. I can now turn my attention to the thing I agreed to do in April. I can start to build the website for NEWACC!